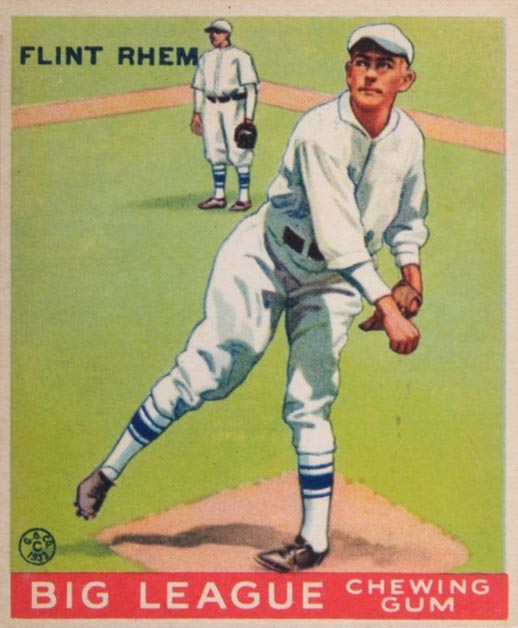 Rhem won two World Series with the Cardinals just prior to its Gashouse Gang era, so-called for their willingness to wear smelly uniforms and play to a lower-class image. The team's still well-known thanks in part to star Frankie Frisch's later manipulation of the Veterans Committee. Frisch used his influence and support from other friends with voting power to enshrine several teammates of questionable qualification as Hall of Famers, cementing a successful team as "legends" (more at Wikipedia). 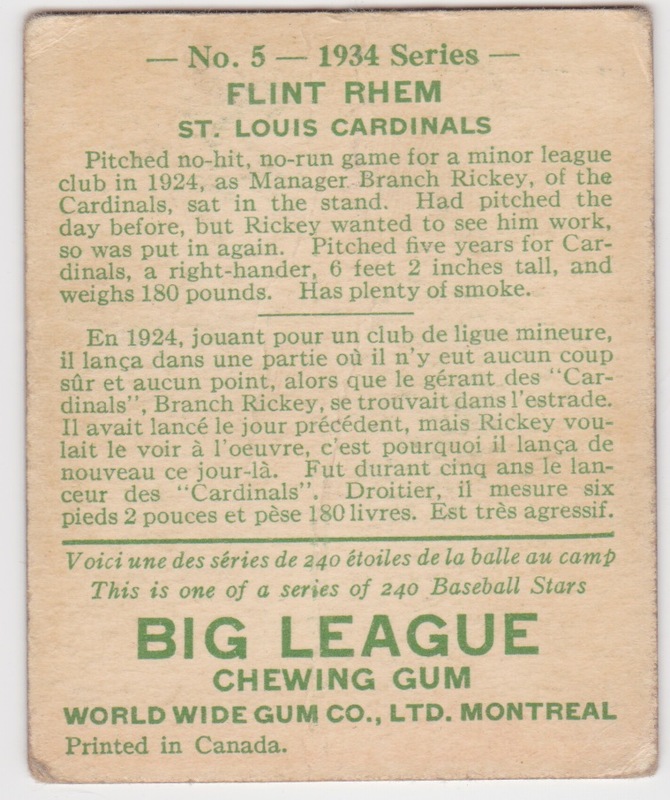 Boston-based Goudey Gum licensed their card design and checklist to Montreal's World Wide Gum for Canadian distribution during the 1930s, so many collectors know those sets as "Canadian Goudey." They're available with English-only backs or, like this one, mixed French-English. 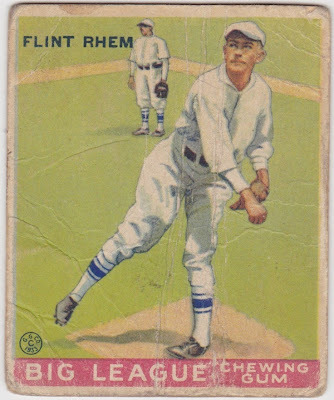 This card calls Rhem a Cardinal, but its blue-and-white uniform mean the picture's from Philly, where he spent 1932-33. The back text is current in the sense that Flint returned to St. Louis for the start of 1934, but soon departed for Boston's Braves (career record). American-made Goudey cards feature banners with "Lou Gehrig says..." or "Chuck Klein says...," but World Wide Gum didn't adopt that design until their midpoint. Cards 1-48 reuse 1933 fronts (and perhaps even printing sheets), only updating bio text. 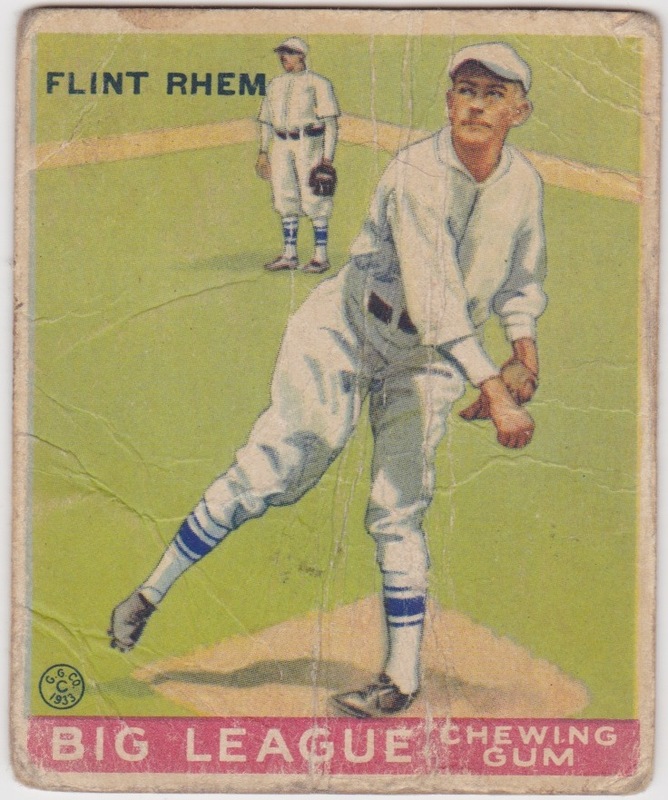 This #5 looks the same as Rhem's 1933 card, down to the "G.G. CO (c) 1933" stamp at lower-left. Uncut World Wide Gum sheets show the 1933-34 differences. 5. 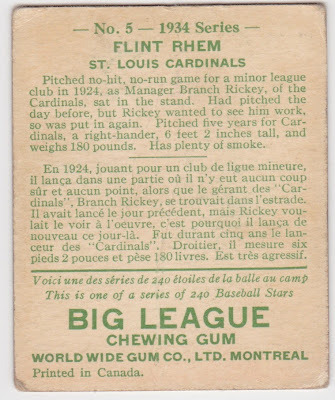 World Wide Gum cards are scarce, but not especially expensive. I recently sold several low-grade 1933-34 cards on eBay and they all closed between $6 and $20. You'll have a hard time tracking them down, given a smaller print run and foreign distribution, but don't expect to pay much more than equivalent Goudeys when you do.